Amidst all the rushing around during Fashion Week, there are occasions when I get a little break before I have to dash off to my next show. 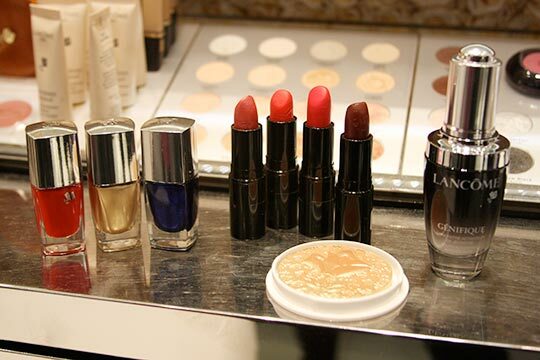 Such was the case on Wednesday when I attended a bloggers-only event at the Lancme boutique on Columbus Avenue. I checked out the current color collection, Pink Irreverence, and got a way-in-advance look at the fall makeup collection, Declaring Indigo. I had already seen a few of the shades, including the awesome nail polishes, backstage at the Chris Benz Fall 2009 fashion show. I also got a sneak peek at the soon-to-launch skincare concentrate Gnifique. The so-called “Youth Activator,” is pretty high-tech; it’s supposed to boost gene activity and help raise protein levels so skin looks younger and more luminous. I’m usually not a big fan of concentrates — they tend to feel too sticky — but this one felt more like a fluid than a serum and made my skin feel super-soft.